SAXTON - Anglia, Regnum si quod aliud in toto Oceano ditissimuin et florentissimum. [imprints] Christophorus Saxton describedat, J.le Clerc ex. SAXTON, Chr. / CLERC, J. LE - Anglia, Regnum si quod aliud in toto Oceano ditissimuin et florentissimum. [imprints] Christophorus Saxton describedat, J.le Clerc ex. Title : Anglia, Regnum si quod aliud in toto Oceano ditissimuin et florentissimum. [imprints] Christophorus Saxton describedat, J.le Clerc ex..
Map maker : SAXTON, Chr. / CLERC, J. LE. Size : 14.9 x 18.6 inches. / 37.8 x 47.2 cm. 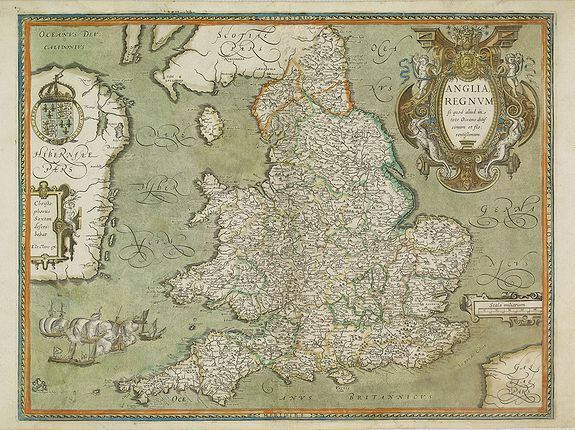 Description :Rare map of England, with elaborate title cartouche, and Royal coat-of-arms A close copy of the Saxton (c.1543-1610) / Ortelius map of 1603, however slightly smaller. According Shirley there is another state without the signature of Le Clerc. In 1654 Le Clerc's plate was used by Pierre Duval. Condition : In good condition. No text on verso.